Everest Academy: Student Spotlight - Emily Rabbideau wins Homeschool County Spelling Bee! Student Spotlight - Emily Rabbideau wins Homeschool County Spelling Bee! CONGRATS EMILY!!! Thanks for representing the homeschooling community in such style!!! The Alabama Spelling Bee was held on March 11, and Alabama's homeschool community was aptly represented by Emily Rabbideau. The competition started with 55 contestants, and Emily tied for 4th place! She spelled several "out of book" words--words that were not included in any of the study materials--correctly, which shows how hard she studied and that she's a talented speller. Everest Academy 8th grader wins Homeschool County Spelling Bee! CONGRATS EMILY!!! Best of luck on the Alabama State Spelling Bee!!! 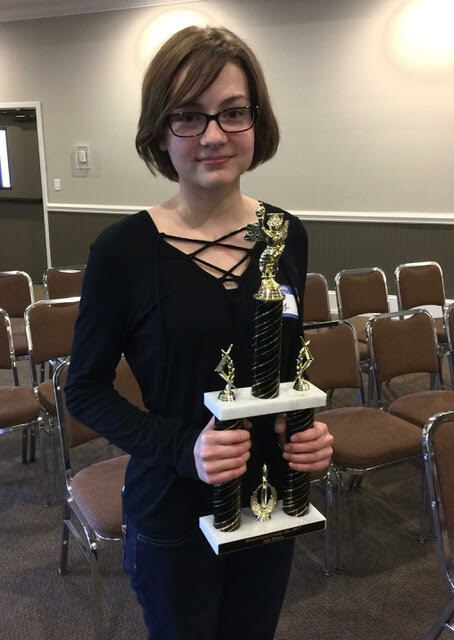 Emily Rabbideau went up against the best homeschool spellers across the state last Saturday to win the Homeschool County Bee. She will now go on to the Alabama State Bee as the homeschool representative. The top spellers from each county in Alabama will compete on March 11th for the chance to represent Alabama at the Scripps National Spelling Bee in Washington D.C. in May.